Tonight in class we watched some scenes from the film Manufactured Landscapes by Edward Burtynsky. The movie answers the unasked question of where all of our recycled things go. Burtynsky takes landscape pictures of these places that have been changed by human activity. The video follows him to China where there are these landscapes that entirely full of recycled metal and the people who work at the nearby factories. Its amazing how much metal he captures in one single area. We also watched a slideshow with commentary by Burtynsky. In the slideshow he says that he was inspired to do the work he does now after getting lost. He was originally in a city in Pennsylvania to do some normal landscape photography, but after going off the trail and getting lost, he came across an area that had been changed by man’s interaction with it. And since then he has photographed these “manufactured landscapes.” Its unreal how he can make these somewhat ugly areas look beautiful with the photos he takes. Here is a slideshow of Edward Burtynsky and some of his images. We watched the second half of the Annie Leibovitz movie in class tonight. After working for Rolling Stone, Annie moved on and worked for Vanity Fair and Vogue Magazine. The film described the relationship that Leibovitz had with her close friend Susan Sontag, and many of the people interviewed i the film said they they complimented each other very well. Susan knew how to describe Annie’s work , she was the more verbal person, while Annie was the more Visual f the two. It also talked about the deaths of her father and her friend Susan. It was a very somber part of the film and there were parts where Annie would break into tears. Photography is a way that Annie escapes from the sadness. The film included more amazinf images that Annie took. I have to admit that I wasn’t really aware of who Annie Leibovitz was, but now after watching this film, I can say that she is one the greatest photographers I have ever seen. 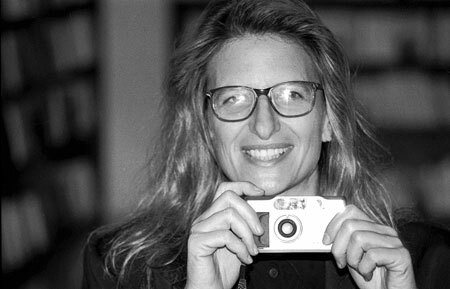 I only hope to be as successful and happy with my career as Annie Leibovitz is.